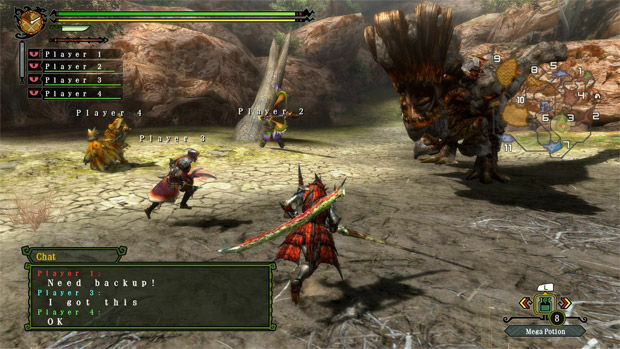 The infamously content-heavy Monster Hunter series is an indefatigable juggernaut in its native Japan, despite being relatively new on the scene compared to some of the popular series that have been around for decades. It doesn’t seem like the United States is going to get that promised Monster Hunter Vita by the end of the year. Instead, series fans without a Japanese 3DS and working knowledge of the language will have to settle for playing Monster Hunter 3 Ultimate, an expansion of Monster Hunter Tri, either on the 3DS or Wii U. It’s perhaps not too much solace, with Monster Hunter 4 possibly dropping around the same time -- March 2013 -- in Japan, but it’s something. 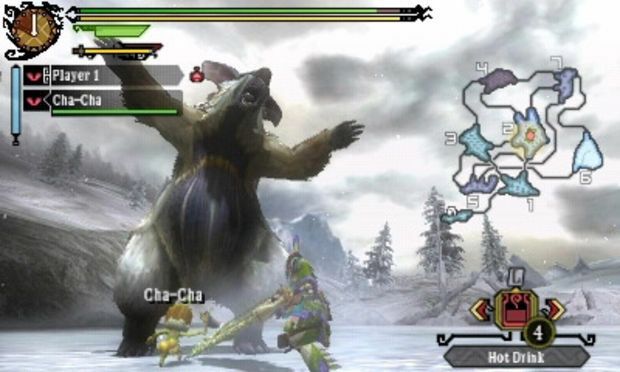 If you’re a fan of the franchise, you’ve likely already played the initial Wii release of Monster Hunter Tri, or at least one other game in the confusingly titled sequence. 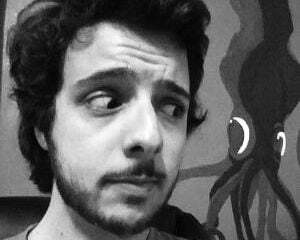 I, however, have never played a Monster Hunter game, fearing the risk of becoming engrossed in a title easily capable, if the stories are true, of sapping away hundreds of hours of my life. Unfortunately, I rather enjoyed what I played of 3 Ultimate, much to the satisfaction of friends who’ve been trying to bait me into the series for a while now. Hopefully this fresh perspective will be helpful for soon-to-be-new Wii U owners, emboldened by your fancy new Nintendo, and 3DS users who have yet to take the plunge. I started with the 3DS version, hunting a mark with three other players seated around a table; cooperative play on the 3DS is local only. As an honest-to-goodness newbie, I opted to take a fleet-footed, quick attacking dual-blade character through the wintry tundra on the trail of some wooly beast. When you’re starting out, you’ll be given some low-grade armor and one of every weapon type, allowing you to experiment with them and see which might suit your style. However, you’re never locked into a role. Gunners (ranged fighters) and blade masters (melee fighters) make up the two classes at which point armor diverges, however, changing your armor to the appropriate garb allows you to get right into the action on the other side of things like James Bond peeling off his wetsuit and exposing a fly tux. Within the classes, there are various sorts of weapons for different play styles, like the Dual Blades or Great Swords or Long Swords. The relatively teeny 3DS screen packs in everything happening on screen pretty admirably, though I did wind up keeping the 3D off, finding it a bit too busy and dizzying. More problematic was the area map, mapped to the touchscreen, which made branches between segmented areas and player direction a bit hard to discern, even upon tapping to zoom. That being said, the touchscreen also features one of the neatest features in its customizability. You can choose which widgets to display, including the new Target Camera. 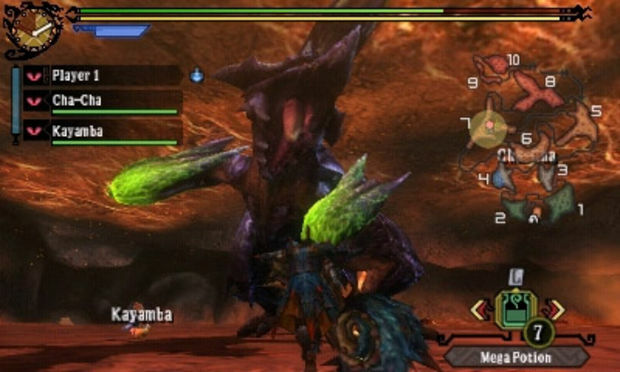 A tap of the target camera will make it so that pressing L automatically reorientates the camera toward the monster you’re hunting, rather than simply centering it. The customizable touch screen is particularly neat on the Wii U. You can effectively remove all the widgets from the Wii U’s gamepad screen, which automatically splashes them on the HUD (or vice versa if you want a clear main display) and lets you keep your eyes on screen at all time. The Wii U and 3DS 3 Ultimates are more or less the same game with minor differing functionality (if you don’t have a Circle Pad Pro, you don’t have a free second stick with which to rotate the camera freely like you do on the Wii U). There’s also some nice connectivity between the two for owners of both or for people with homies. First, the game supports Kojima-coined transfarring, the ability to transfer data between the Wii U and 3DS in order to take your file on the go and bring it back again. Additionally, a Wii U player can posse up with one to three 3DS players locally. As an aside, now that I know this is a thing that works, I am going to be terribly upset if we don’t see a Wii U remake of the original Final Fantasy: Crystal Chronicles. When I jumped to 3 Ultimate on the Wii U, with one ravenous beast notched up on my bed post (or, uh, knife handle), my appreciation of the game became a bit clearer still, perhaps abetted by the crisp HD visuals and 60 frames per second. I quite like the art direction. Technically, it’s not the most detailed, but I dig the lavish vibrancy of the colors and the decidedly Japanese role-playing look. Now solo, I gained some help from two Shakalaka, little helper characters, named Kayamba and Cha-Cha who, incidentally, both reminded me of Final Fantasy: Crystal Chronicles’ Lilties (definitely not going to drop that train of thought until it’s addressed). While you can’t give the Shakalaka orders, they did prove quite helpful in my solo quest to pacify (brutally murder) a tyrannosaurus rex-ical beast. They can deliver pot shots to enemies, occasionally buff your stats, and give you a non-damaging courtesy thwack when need be. Enemies will occasionally wallow in the muck and spew nature at you, leaving you ensconced in a ball of snow or mud or what have you that keeps your character all gummed up and waddling slowly. Teammates -- or Shakalaka -- can give you a love tap to free you from that encumbrance without you taking damage. While these jovial imps will aid you in solo play, they can also tag along in two player co-op, which lets each of you take one of the two with you, rounding out a party of four. Now, in terms of the actual monster hunting, I quite enjoyed what I played. While monsters will certainly engage you if you start throwing sticks at them and whatnot, they’re not above running away to get out of the line of fire, requiring you to give chase like a proper hunt. What’s more, the lack of a health bar requires you to pay attention to visual clues regarding how you’re faring; if a mark begins walking staggered, for example. These cues are also important to the combat, which employs basic combinations, but tasks you with knowing when, where, and how to attack without leaving yourself vulnerable. Having spazzed my through the dual blades -- I often found myself going combo crazy after the mark had left my range, leaving me attacking the air like I ran through a spider web -- I opted to go solo with the appropriately opposing Long Sword, a much stronger and slower weapon. With great power comes a great necessity to not start long attack animations that end up missing landing blows, because it’s an easy way to get wrecked. In a neat addition, I also managed to focus some blows on my mark’s tail and eventually lopped it off (and I don’t think it was meant to come off like the survival mechanism of certain lizards of modernity), granting me an extra piece of loot on top of the three I would inevitably get when I dropped my target. It may not be a proper Monster Hunter 4, but Monster Hunter 3 Ultimate is appearing on both the 3DS and Wii U for the first time in the series, so perhaps it will breed a whole new slew of fans. Those looking to satiate a Monster Hunter fix get a pretty Wii U version, cool interplay between the 3DS and Wii U, and 17 new monsters, among other little additions. It’s something of an expansion, but at least it seems to be living up to the “Ultimate” moniker. I know it’s definitely done a lot to make me think I may end up finally giving this series a whirl.